Varicose veins are veins that have become enlarged and tortuous. They usually occur in the legs, but can affect other areas of the body such as the pelvis. Venous blood normally flows from the leg to the heart. The calf muscle pump is an important mechanism to compress the veins in the leg and 'push' blood uphill when walking. 'Competent' veins have multiple valves along their course to prevent blood from flowing back downhill with gravity. 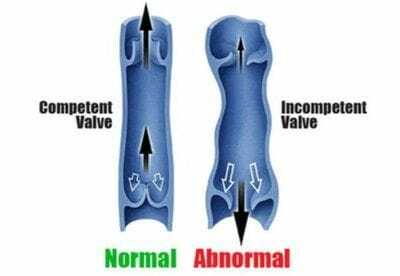 'Incompetent' veins have faulty valves, which allow the blood to flow back downhill and pool in the leg. This increases the pressure in the affected veins (and the veins feeding in to them), leading to enlargement over time and formation of varicose veins. Risk factors for developing varicose veins include a family history, female gender, a standing occupation, pregnancy, advancing age, and obesity. Varicose veins are a cosmetic issue, but can also cause swelling and aching, particularly when standing for long periods. Moderate to severe 'chronic venous insufficiency' can cause staining of the skin (haemosiderin deposition), eczema, scarring of the leg (lipodermatosclerosis) and ulceration. Bleeding can occur from a varicose vein, particularly if the skin overlying a varix is thin. Clot can also form in a varicose vein (superficial venous thrombosis), causing a hard, red and tender patch in the leg (thrombophlebitis). Bleeding and clot require urgent assessment and treatment. Mr Milne offers the full spectrum of treatment for varicose veins. Over 90% of patients presenting for the first time are suitable for minimally-invasive endovenous treatment using radiofrequency ablation in conjunction with injection sclerotherapy. Conventional (open surgery) is reserved for cases where the anatomy is not suitable for endovenous treatment. Return to the Varicose Veins Home Page to learn more about the different treatment modalities.